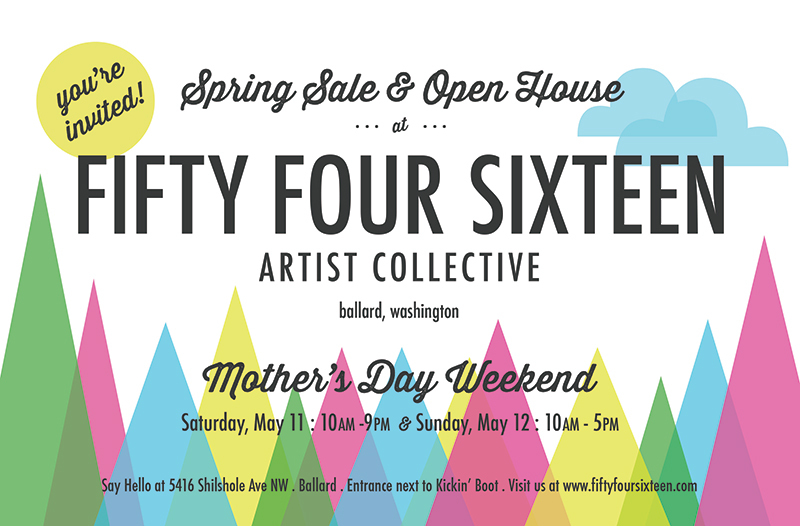 Fifty Four Sixteen is an artist collective in the heart of Ballard. We are a group of friends working under one roof in an effort to make a living doing what we love. We have created a shared space for making, designing and collaborating. We invite you to stop in and say hello! You can find us at 5416 Shilshole Ave NW, Seattle, above Northrop Case. The main entrance is located next door to The Kicken' Boot, between Ballard Avenue and Shilshole Ave NW, in the alley off 22nd Ave NW. Look for the umbrella sign! John Hogan : John Hogan DesignsSalmon Bay Cup Co.
Sundays from 10am to 3pm during the Ballard Farmer's Market (90% of the time). Spring Sale and Open House! Mother's Day Weekend!